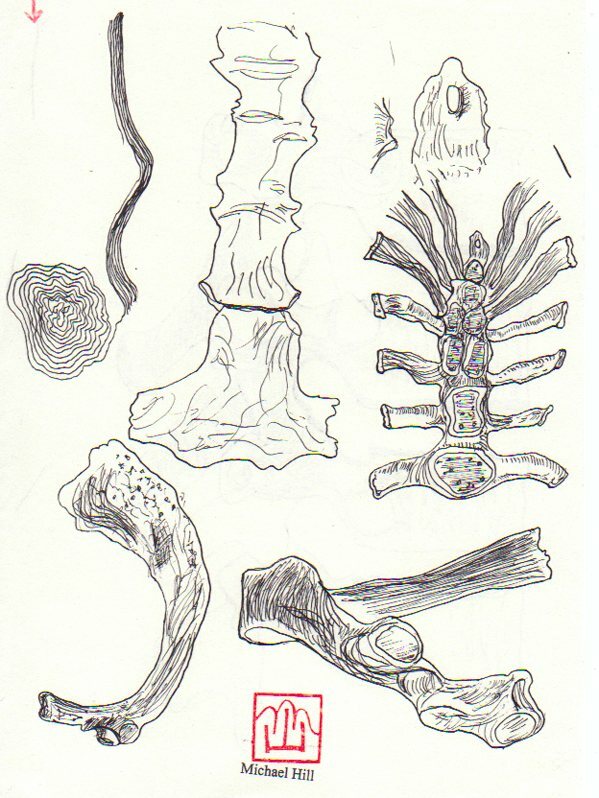 I mentioned last time that I have been doing some drawings of bones. In Chapter 1 of the artist book/comic I used fish bones as an image and as a printmaking substrate for the sosaku hanga technique on the AFTER DINNER PRINT pages. 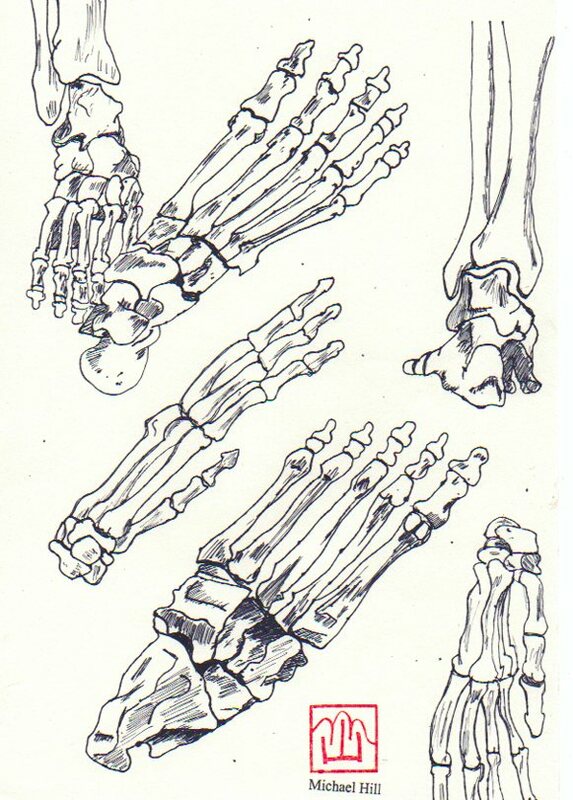 In Chapter 2 there will be drawings of human bones of the hand and foot. I have had the opportunity to study some broken bones incurred in falls from bicycles. Perhaps there will be more about this in the next report but speaking of cyclists I also make reference to the Bookseller of Glee character who was scheduled to appear in the first issue but ended up being edited out (see production report No. 6). This bookseller rides a penny farthing type of bicycle and will play a part in this issue. 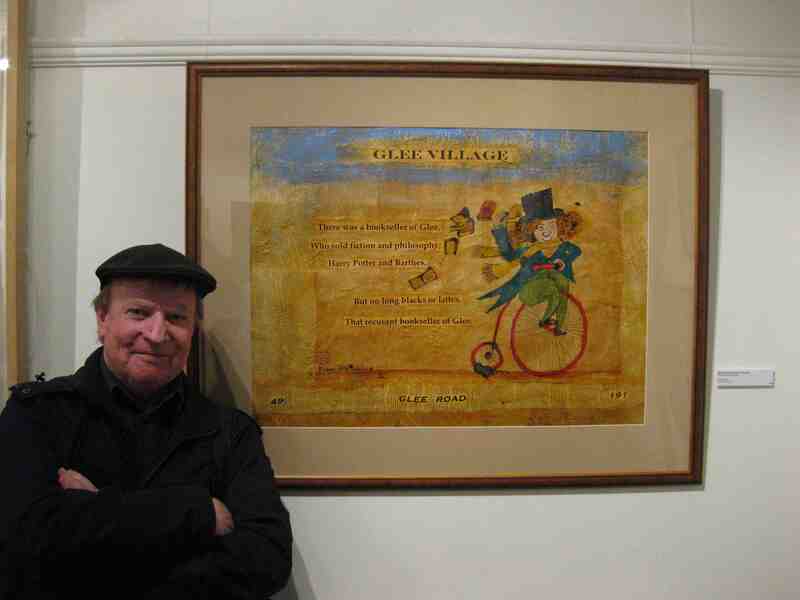 I had my portrait of this gentleman in the Glebe Sesquicentenary Art Exhibition(see below) and then it was a finalist in the 2010 Bald Archy Prize: The Bookseller of Glee (mixed media-drawing, painting and collage on paper): A postmodern portrait of Roger Mackell, co-owner of Gleebooks (4 time Australian Bookseller of the Year), as a generous character gleefully disseminating books and promoting the joy of reading. The portrait caricatures the proprietor and his store’s contribution to the intellectual life of Glee Village, its nearby universities and the community by virtue of its main street constructed from the writings of French literary critics and philosophers whose work the store made available in the 1980s and the populace is collaged from pages of Shakespeare, Dickens and Australian fiction. This entry was posted in Art, Blotting Paper, Comics, Japanning and tagged artist book, Bald Archy Prize, collage, drawing, joy of reading, pen and ink, printmaking, Roger Mackell, sosaku hanga by Doctor Comics. Bookmark the permalink.